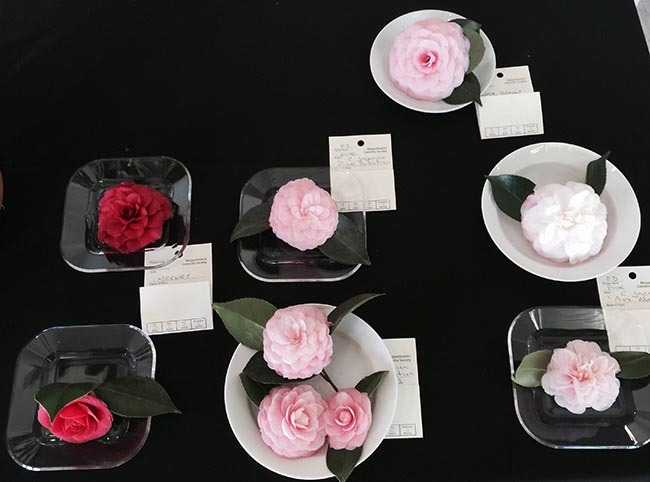 An entrants camellias await being groomed and set out on the benches at America's oldest flower show, the 187th Camellia Show held by the Massachusetts Camellia Society held this past weekend at the Tower Hill Botanic Garden. It's as if Downton Abbey meets the Philadelphia Flower Show, or as if a greenhouse from the nineteenth century suddenly came to life again in the middle of winter. 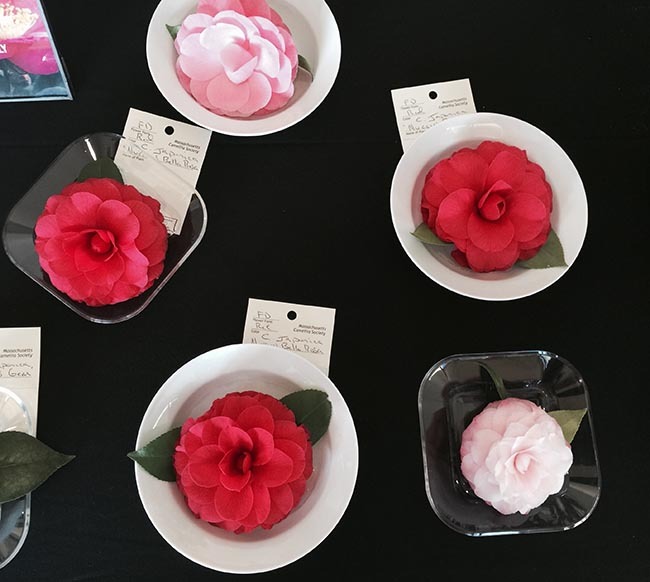 This weekend, I participated in the Massachusetts Camellia Society's 187th annual show - which happens to hold the honor of the oldest continuous flower show in the United States. 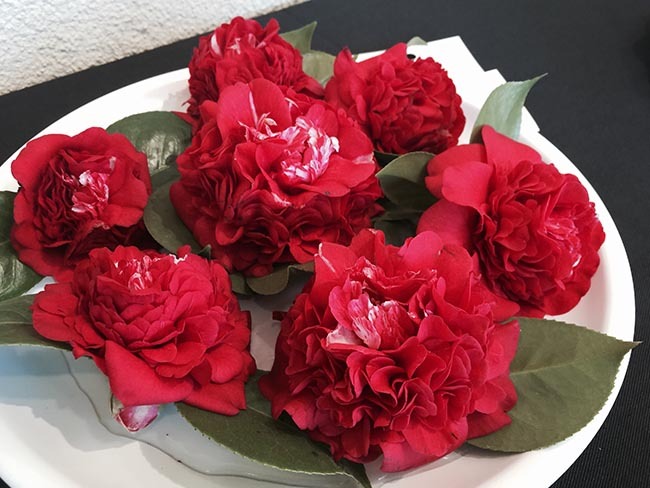 So special and rare today, at least in the North, camellias continue to capture the imagination of flower lovers, and maybe, just maybe, they are making a comeback, even if only a handful of people can raise them today. Some very nice Semi Double camellias, waiting to be benched. If you live in California or in the south, it may seem rather unimpressive, the idea of a camellia show, but in the north where camellias are not hardy, they are today, a very special thing, as few people can grow this somewhat tender Asian tree unless they have the luxury of a cold greenhouse. 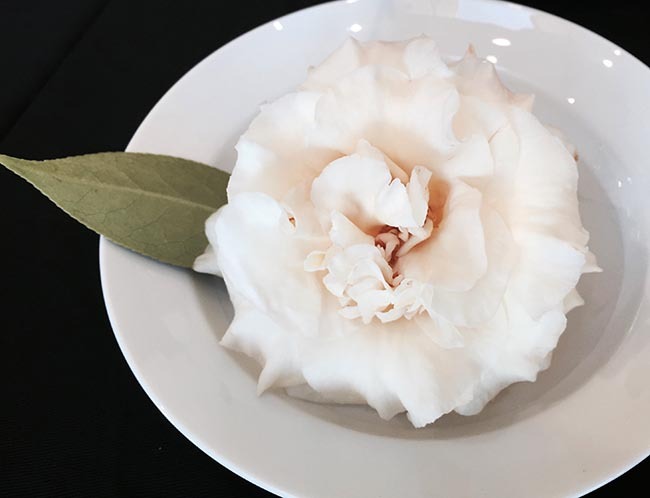 I would would go a step further and say that not only do very few people raise camellias anymore, but most people north of Washington D.C. have even seen a camellia, let alone touched one or smelled one (some can be very fragrant, although most have no scent.). 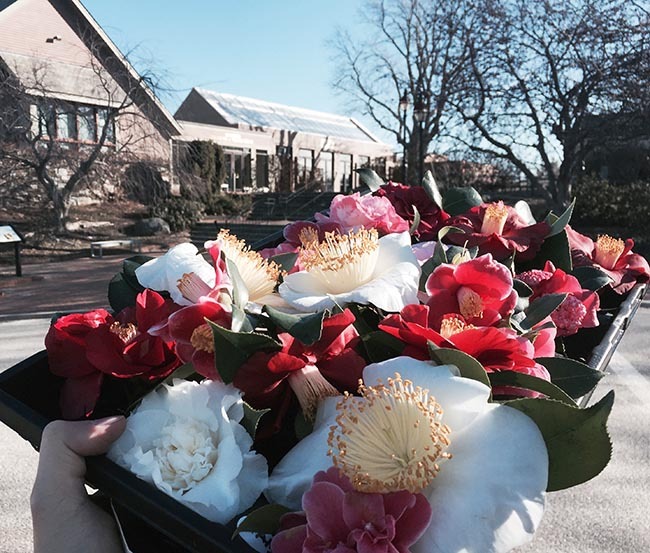 My tray of camellias, which I picked that morning, make their way into the exhibition hall at last Saturday's 187th annual Camellia Show hosted by the Massachusetts Camellia Society, held at the Tower Hill Botanic Garden in Boylston, MA. In many way these are living antiques in the north, which is sad, since a hundred years ago they were as common at florist's greenhouses and in estate greenhouses as were carnations or chrysanthemums in the winter. 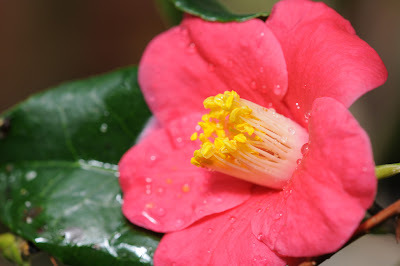 Native to China, Korea and Japan, camellias do prefer cool to cold winter temperatures, but since they are late winter blooming and have glossy, evergreen foliage, they cannot survive hard freezes below the mid 20's without damage. 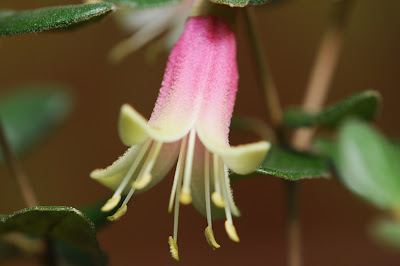 In a cool or cold greenhouse they thrive in the cool, damp sunny environment, spending the summer out of doors when they do most of their growth, and then wintering over under glass - there is hardly a more perfect winter blooming tree. In a home, they are practically impossible to grow, unless one owns an old house with an unheated bedroom, which preferably is drafty with bright sunshine. 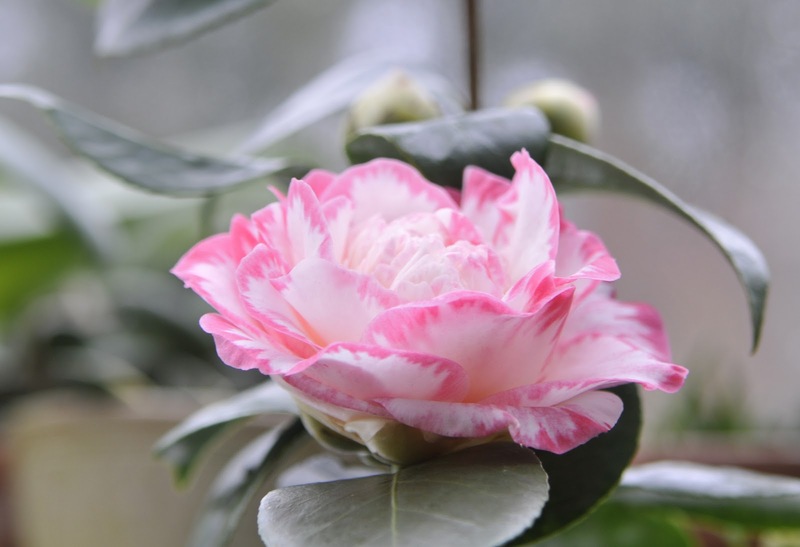 A few people can raised them on unheated porches which are glassed-in, or in conservatories, but generally, camellias are known as rather low maintenance, long lived greenhouse trees which prefer to be planted in the ground under glass, or in large tubs where they can remain for decades. Exhibitors entering flowers take great care, from picking them in the morning early, to selecting only the most perfect, with no damage on the petals, no pollen stains, and good leaf arrangement. 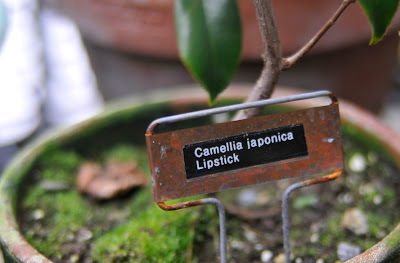 These here are from the Lyman Estate greenhouses in Waltham, MA, another old collection in the Boston area. 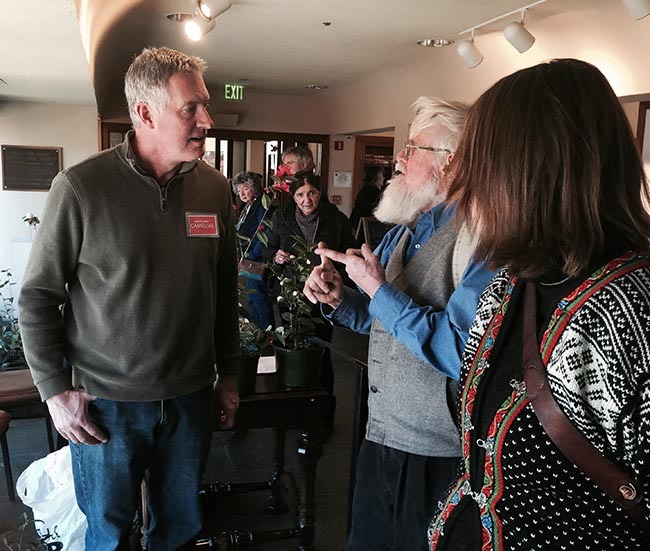 At this weekends show at Tower Hill Botanic Garden there were a few hundred blossoms on display. 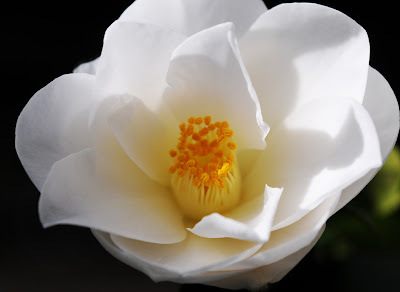 I think that guests never realized that there were only about six exhibitors, which gives you an idea of how endangered the New England camellia collections are. 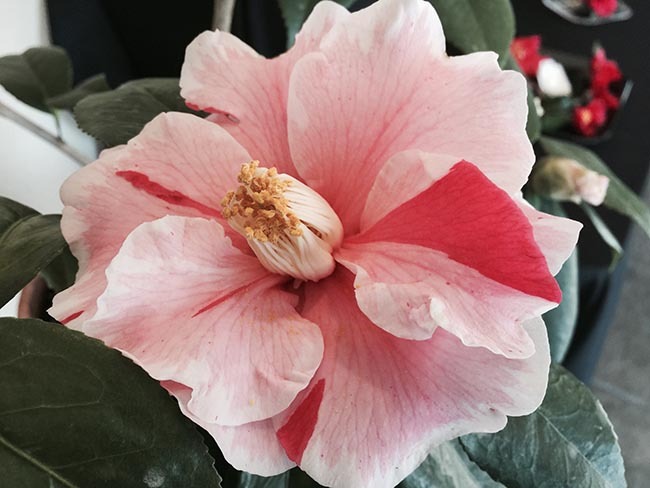 I was asked to be a judge again (I judged two years ago) and my good friend Glen Lord was also asked - we are both camellia growers, but not very serious collectors, at least yet. 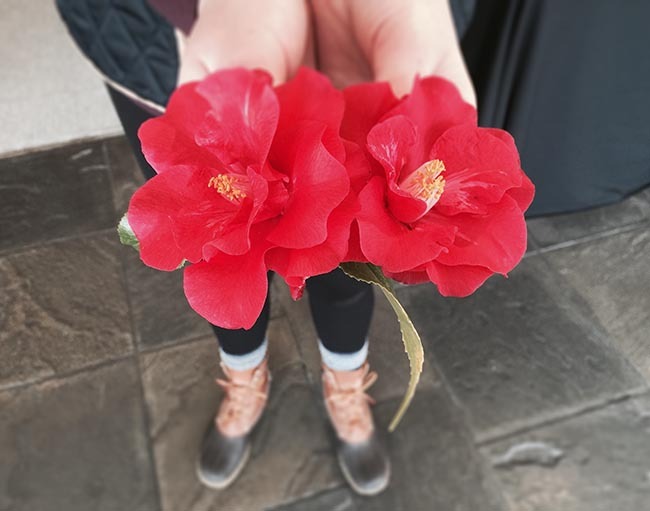 Camellia enthusiasts are a rare breed in the North today. Most of my plants came from Nuccio's Nursery in California. When I travel to LA on business, I always try to make a side trip to this landmark Pasadena nursery. I have them pack plants up in crates which I bring back on the plane. 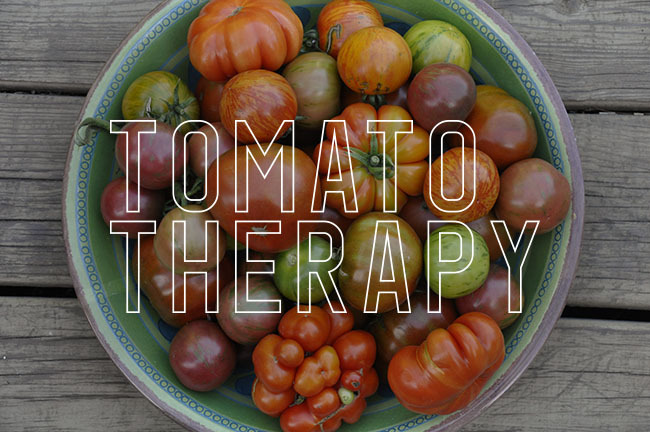 I prefer to pick out the varieties I want (usually in early February) when they have them displayed on wooden tables. 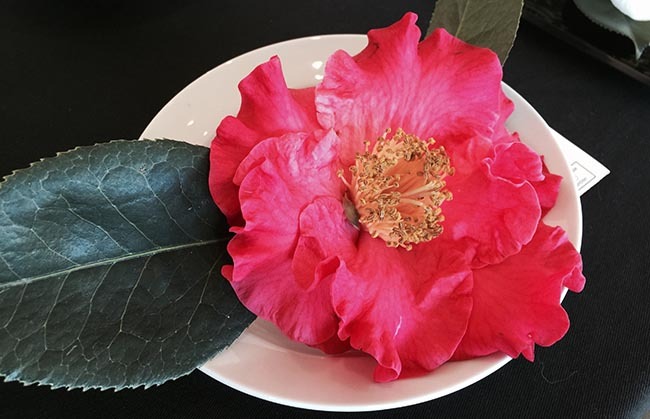 Camellia shows display flowers in small dishes or in bowls, in much the same way we home growers display camellias in our homes - in plates, or floating in a bowl. 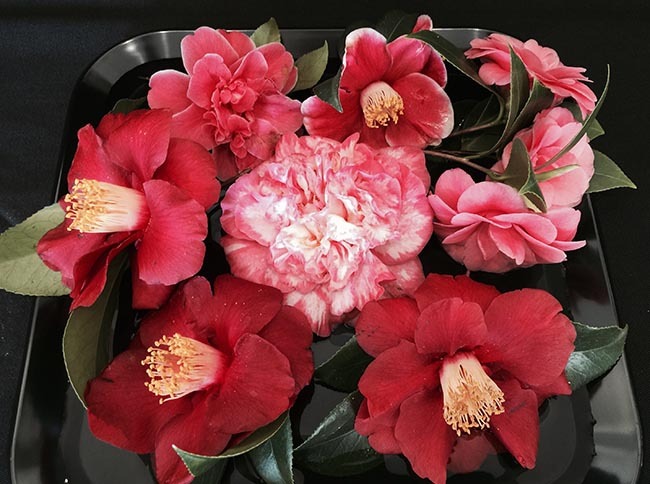 I've come to appreciate a February holiday such as St Valentines Day or Presidents day as represented by a bowl of camellias. Surely, any 19th century person would find such a display a very proper solution, and an appropriate one for an parlor or dining table in the era. The Formal Rose or Formal Double form is perhaps my favorite, often the petals of these forms are so perfectly arranged in lovely fibonacci symmetry. I an imagine Mrs. Lincoln with one of these as a corsage, can't you? Some white anemone forms which never made it onto the display bench. This is how one exhibitor brought his flowers to the show. They are picked in morning early, and last out of water for a few hours before being groomed and set onto the benches. Pale yellow forms are being introduced. This one is the color of heavy cream, but considered close to yellow. 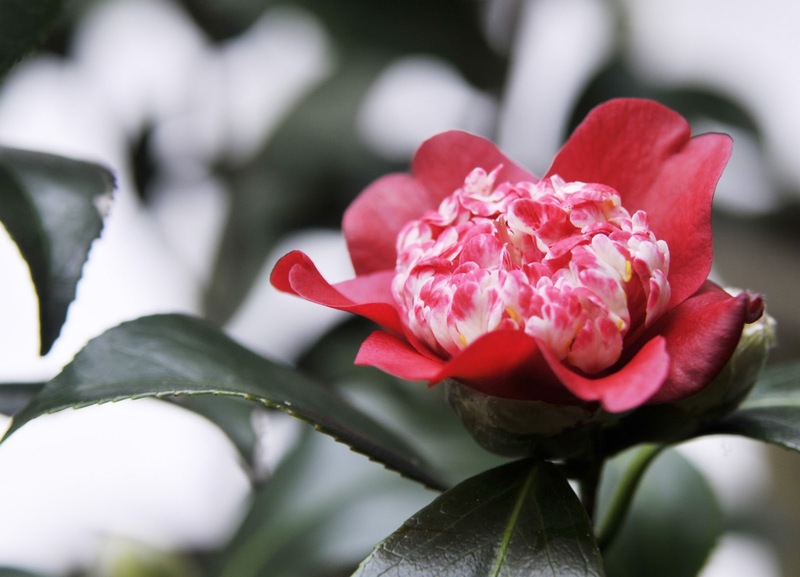 The variety is a Japanese one 'Ki-No-Senritsu'. 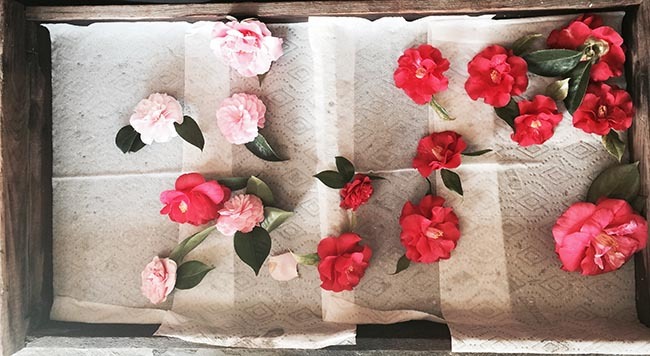 Extra flowers are often not tossed into the trash, but arranged on a tray to fill some of the tables. These are some of mine, which I did not exhibit. More Formal Doubles arranged and set on the bench awaiting judging. 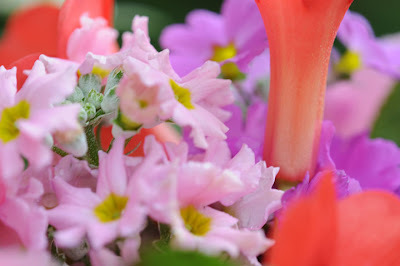 Flowers can be entered as singles or as a triple entry. This plate of 'Charles Sargent' each showed some very nice variegation, and nice arrangement of petals. This tree won Best in Show in the potted plant category. 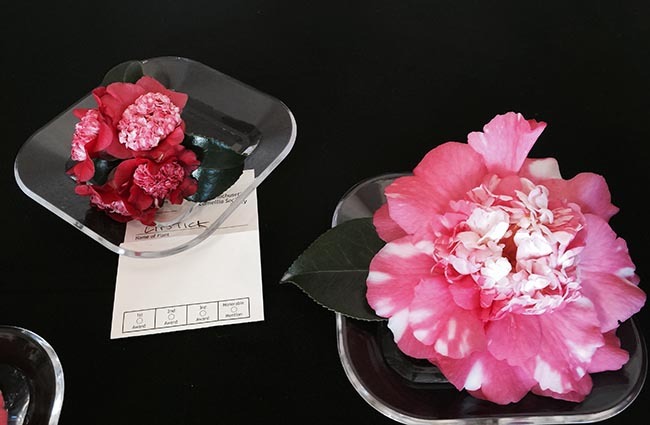 The flower on the right made it to the Best In Show table to be considered as Best in Show, while the anemone form flower on the left called 'Lipstick', which I entered, came in second in the anemone flowered class. Can you guess who this man in in the middle with the beard? 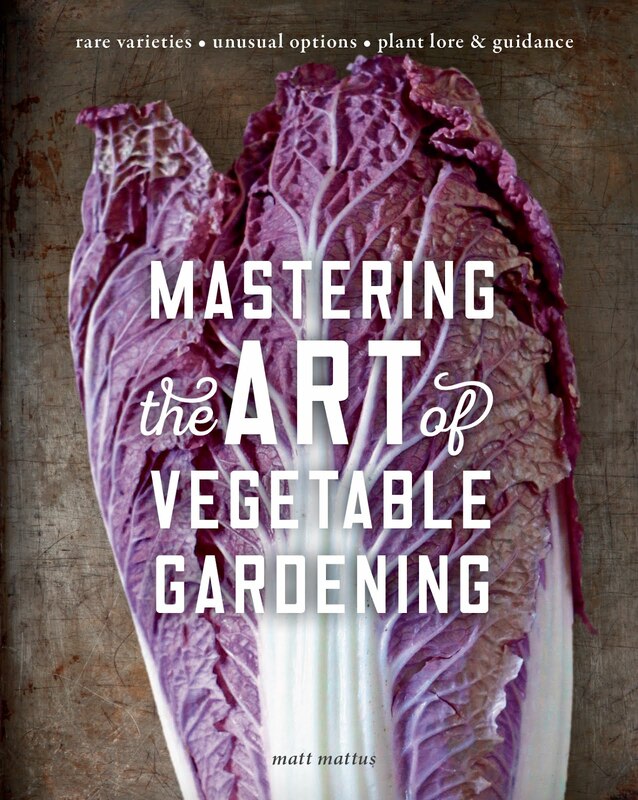 That's Roger Swain from the PBS show Victory Garden. He joined us at the judges luncheon, and entertained us with stories. He admitted to me that he's a huge blog fan, and I was very flattered! More excited than when I met J.J. Abrams! Just before judging, the final touches are made. 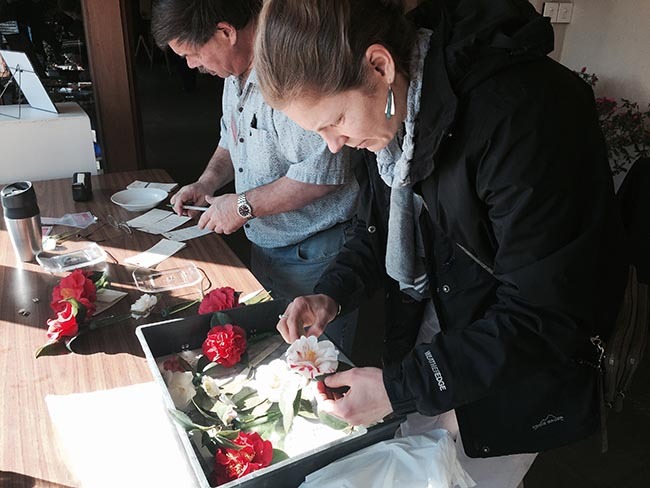 Extra flowers that never made it to the bench, are removed, and all labels are checked for accuracy. By noon, the crowds arrived. 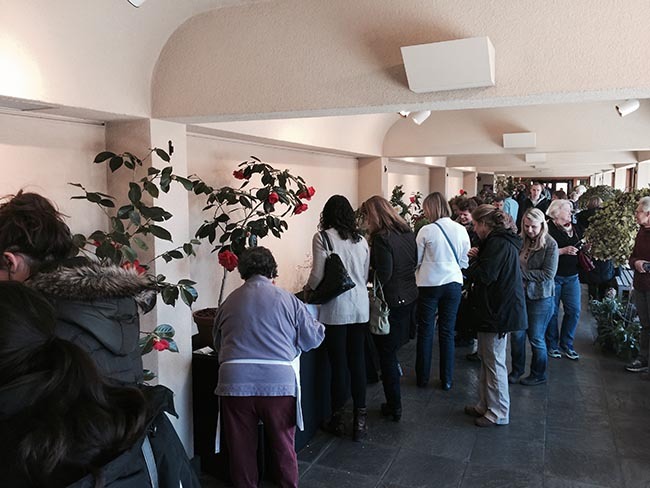 The line to enter the botanic garden was long, and the parking lot was full. 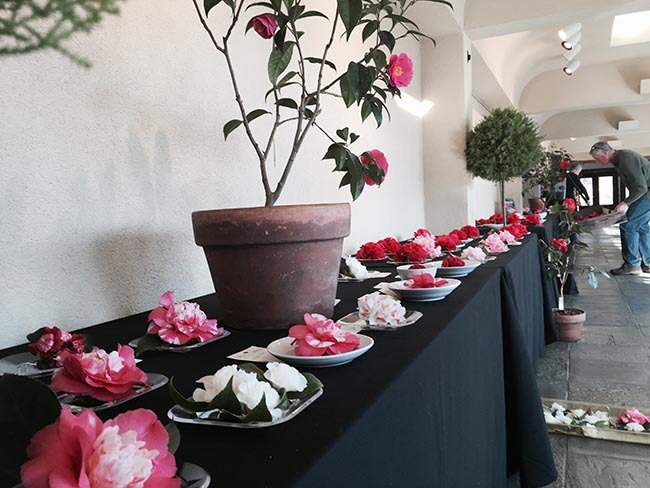 Not bad, for a camellia show! 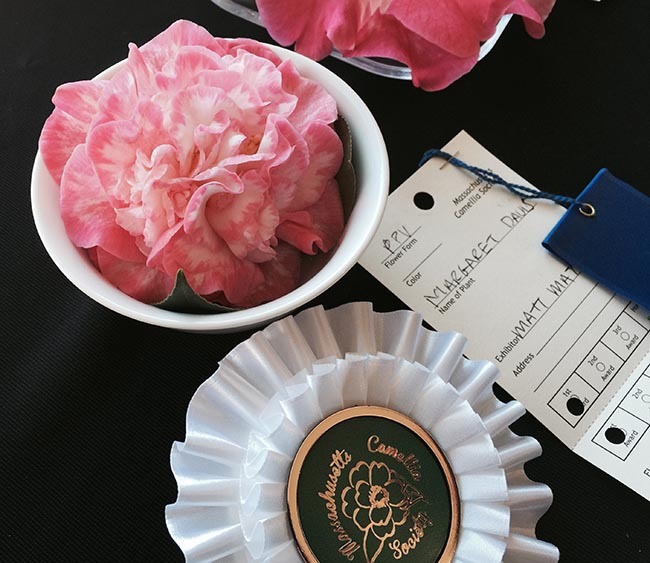 I was shocked to have one of my flowers win Best in Show! I stepped out of judging at this point, it just didn't seem right. I was very honored. There were many entries which I felt should have won, like this bicolored semi double Higo type. Both Glen Lord and I fell for this ruffled one. It's named 'Mooching', and it's a Camellia reticulata, a different species from most of the doubles, which are bred from C. japonica. I love the boss of stamens on this bright red Higo type. Most of the potted trees in the displays are part of the Tower Hill collection, which came from the collection which was once housed at the Isabella Stewart Gardner Museum in Boston. Talk about an important collection with provenance. It's a very snowy weekend here in New England, and we are expected to have almost constant snowfall from Friday night, until Sunday night. Accumulation is expected to be less than 5 inches, because it is a very light snow. Very cold and pretty outside, in the greenhouse, it feels more like a cloudy day in Tokyo. 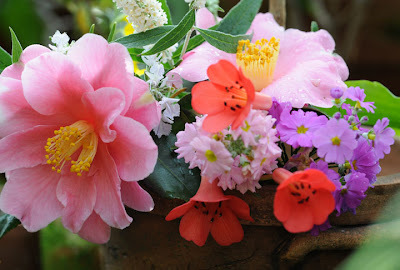 Here are some new camellia images, with some new varieties blooming for the first time today. 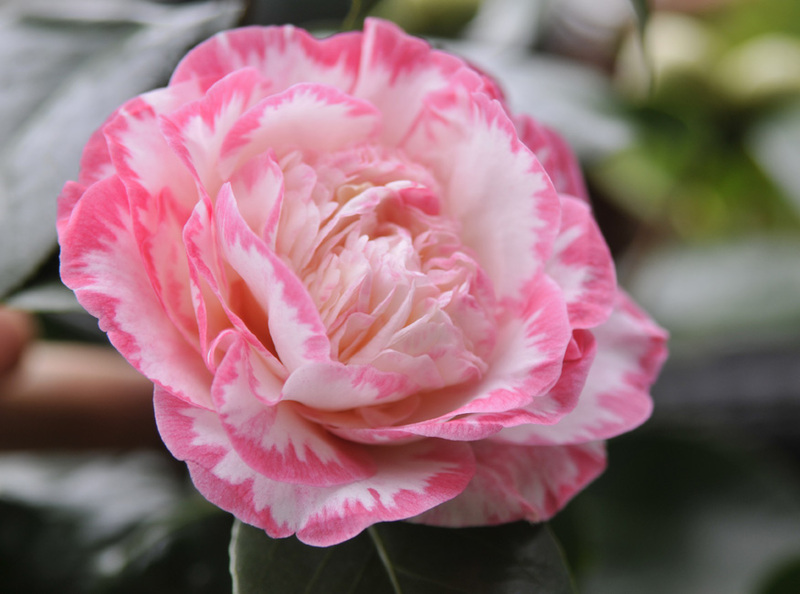 Camellia japonica 'Margaret Davis', a lovely bicolored blossom with a striped edge. The pink color is almost florescent. Camellia 'Lipstick', this odd blossom is referred to as an anemone-form. The Japanese are currently in love with this crested floral form, which they call BOKUHAN, most growers refer to this floral form as 'anemone form'. This variety, 'Lipstick' is a new addition to my collection, and this is its first blossom of the year. It's a very young plant from a cutting. 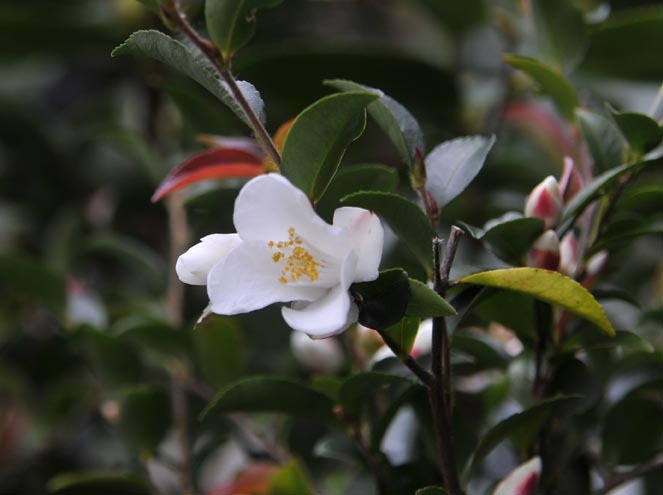 Camellia 'Silver Tower', a form that the Japanese call HAGOROMO. Hagoromo means 'feathered robe' or 'celestial robe'. 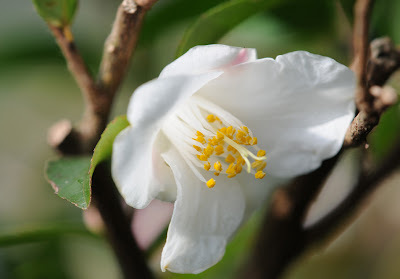 Camellia lutchuensis, a fragrant species in its pure form, collected in China. This blossom is less than an inch long. 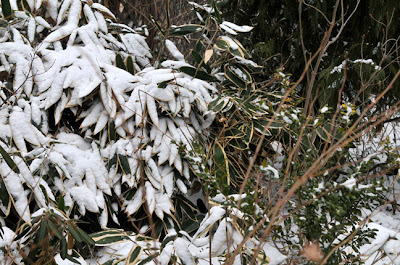 Hardy Japanese forest bamboo, Sasa vietchii holds the snow well. With only a few inches expected today, the snow remains on the flexible leaves. This bamboo looks best in the garden in early winter. 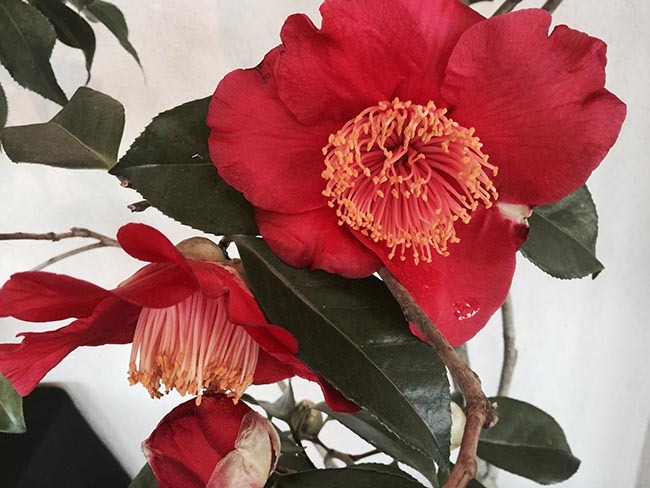 A Higo-type camellia, with its huge boss of stamens seems to be waiting for the winter sunshine before it decides to open on this chilly, snowy, day. 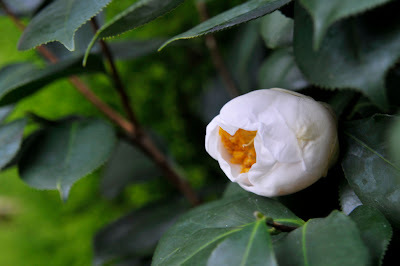 A Camellia bud opens on a larger shrub, planted in the ground in the greenhouse. 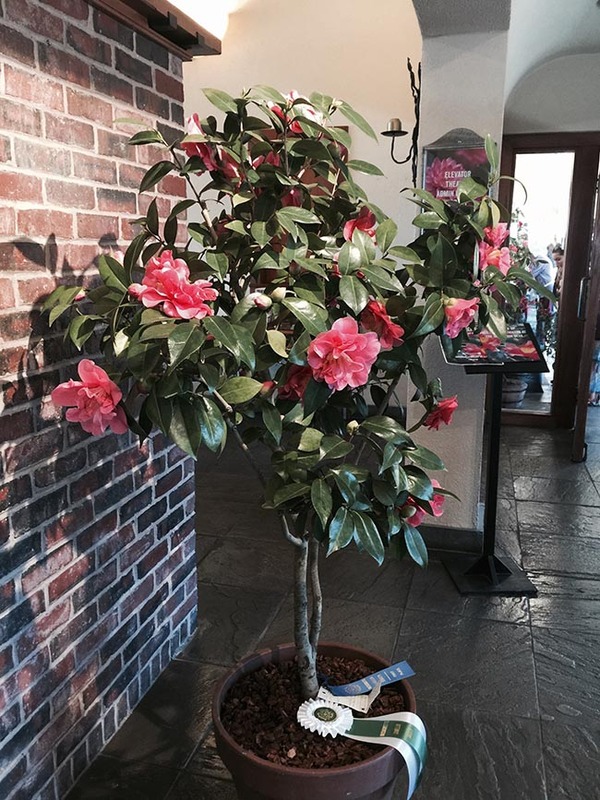 I've found that the camellia's that are planted into the soil, do better than the potted ones; they grow faster, and stronger. 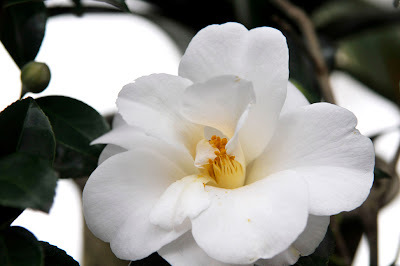 Many Nineteenth Century heated greenhouses in New England had large camellias planted in the soil for use as winter corsage material for winter weddings and for the local florist trade. Around Valentines day, the tipping point happens - for by mid-February, the sun begins to feel stronger. One notices the days staying longer, ( it's light out when I leave work now), and the plants all seem to know that spring is coming, for suddenly, buds start to swell, and many plants begin new growth. 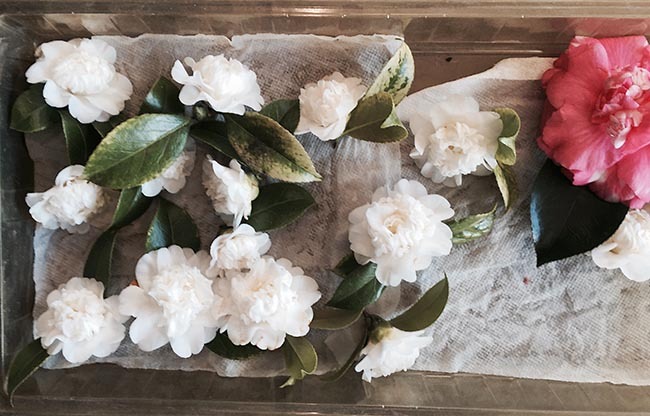 This is Camellia season, both in California and under glass in the cold, snowy north. 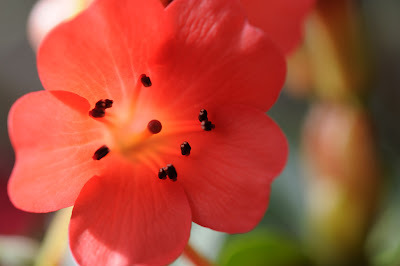 So on this St. Valentines Day, I simply will share some images of what is in bloom today. The Vireya crossed made with x 'Saint Valentines Day', are all good bloomers, and this one, which has lost its tag, is appropriately in full bloom. The Hobby Greenhouse Association of Massachusetts had their garden tour in our greenhouse yesterday, we all had a good time and thankfully, it was sunny. 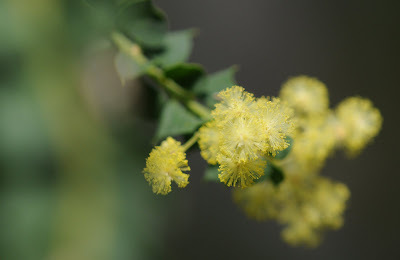 This Acacia pravissima caused some chatter, since it looks very much in like many Acacias one sees in northern greenhouses. 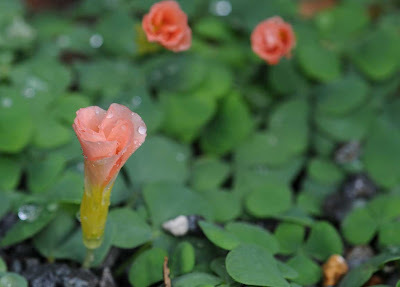 The mid-season Cyclamen species are starting to bloom, here, a cute tiny C. trochopteranthum blooms in an alpine pan. This relatively new to cultivation, species comes from a limited area in south-west Anatolia, Turkey. 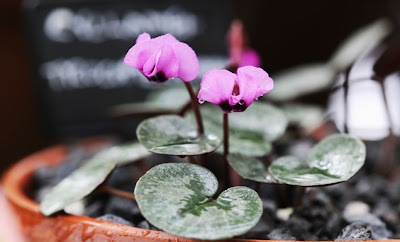 It was first classified as C. alpinum, but recently the Cyclamen Society is researching wild populations to clear-up this muddled genus, with the first task of clearing up the taxonomy within this species where there seems to be two variants. Which ever one I have, it clearly is not as floriferous as some of the photos I've seen in England, but, then again, I don't fuss over mine that much. 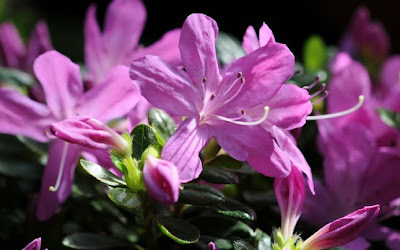 One of my new Japanese Azaleas, Azalea kurume from Nuccio's Nursery in California is starting to bloom, the color is perfectly purple. The Correa Western Pink, that I brought back from Oregon last March, is still in bloom. I don't think that there was a day all year, that this shrub from Chile didn't have flowers on it. 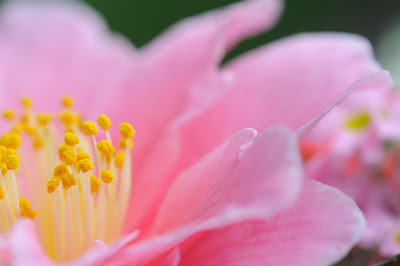 A Pink single Camellia from Japan. 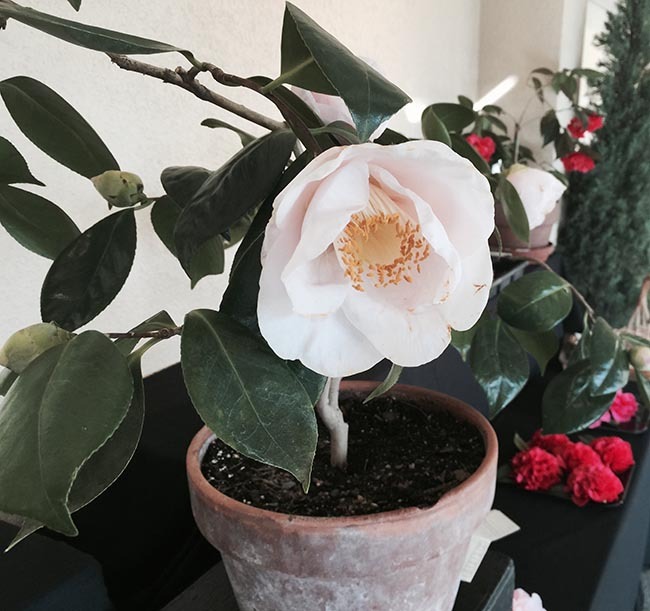 The single Camellia's are all blooming a bit late, this one blooms more typically at the Holidays. This one looks big, but the flower is the size of a nickle. The species form from China of Camellia lutchuensis. It's fragrant, too!